Dubai Municipality has launched the third operational site of the Food Bank in Al Muhaisnah-2 in Dubai on Tuesday. Dawoud Al Hajri, director general of Dubai Municipality and deputy chairman of the UAE Food Bank launched the site of the in the presence of the members of the Board of Trustees of the Food Bank and a number of senior officials. The UAE Food Bank also signed strategic partnership charters with Saudi Food Bank, “Eta’am” and the Sudanese Food Bank on the occasion. The charters were signed by Khalid Mohammed Sharif, CEO of Dubai Municipality for Environment, Health and Safety and chairman of UAE Food Bank Operation and Facilitation Committee, Abdullatheef Bin Abdullah Al Rajhi, chairman of the Board of Directors of Eta’am and Loay Salah Hamid, director of the Executive and External Relations Office of Sudanese Food Bank. “Through the UAE Food Bank, we seek to consolidate this aspect in our new generations by offering everyone the opportunity to be part of a lasting charitable and humanitarian approach. The UAE aims to reach new heights in charity as Zayed wanted for his people,” said Al Hajri. Al Hajri explained that it is necessary to transform the Bank's sites and branches into institutions that attract young volunteers to train them to gather, sort and re-pack foods within the approved safety standards, and contribute in creating a generation that recognizes and embraces the value of humanitarian work, so as the legacy of the founding fathers continues to consolidate the UAE's position as the world's charity hub. 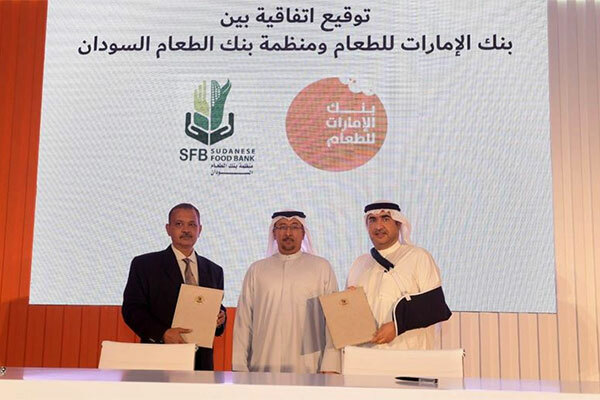 In addition to Saudi and Sudanese food banks, the UAE Food Bank also signed partnership agreements with Almarai and Thani Capital companies. It was agreed that these companies will be supporting the operations of the UAE Food Bank and ensure that the health and safety standard specifications will be applied for the surplus food to ensure that they are fit for human consumption. The guidelines for the conservation and storage of food will be followed and the volunteers will be given training in accordance with food safety and health standards for ensuring the safety and quality of food donated. The agreement with Eta’am is aimed at exchanging experiences and benefit from their expertise and learn the best practices in the field of preserving the food from being wasted and destroyed. The UAE Food Bank under the umbrella of the Mohammed Bin Rashid Al Maktoum Global Initiatives is considered an integrated humanitarian system that deals professionally with surplus fresh and canned food to ensure its safety and quality under the supervision of the competent authorities and distribute it within the country in cooperation with a network of local and international food establishments and charitable and humanitarian organizations. The third operational site of UAE Food Bank will be an indicator of the success and spread of the Bank's experience. It is worth mentioning that the official inauguration of the first operational site of UAE Food Bank was preceded by a pilot launch, during which all the technical, technological and logistical aspects were monitored and follow-up of the collection and distribution process. The UAE Food Bank has collected and distributed around 4,500 tons of food since its inception. Since the beginning of 2018 until the fourth quarter it received about 790 tons of various foodstuffs.